We plan 12 base lean simulations for Release 1. We have 11 done. The last one will show Load Leveling in an Emergency Department. Jerry has simulated 3 real Emergency Departments in the past, so this one is especially fun. We just finished the first draft, and it looks good! It is simplified compared to a simulation of a real hospital, but it captures all the important elements and behavior required for the training simulation. It will run for 12 months, so we glad we don’t have to roll dice for this one! This entry was posted in New Simulation and tagged Emergency Department, Lean, Load Leveling, Simulation, Training on January 27, 2015 by Jerry Levasseur. We currently have 12 lean simulations (15 if you count the same simulation with different motifs). Here is a screenshot of the simulation demonstrating Little’s Law. If you do not know Little’s Law, don’t worry: it comes with a video explaining what Little’s Law is and why it is important in Lean. Another video shows how to present the simulation to your class in real time. Of course, you can customize your presentation to suit your needs and style. 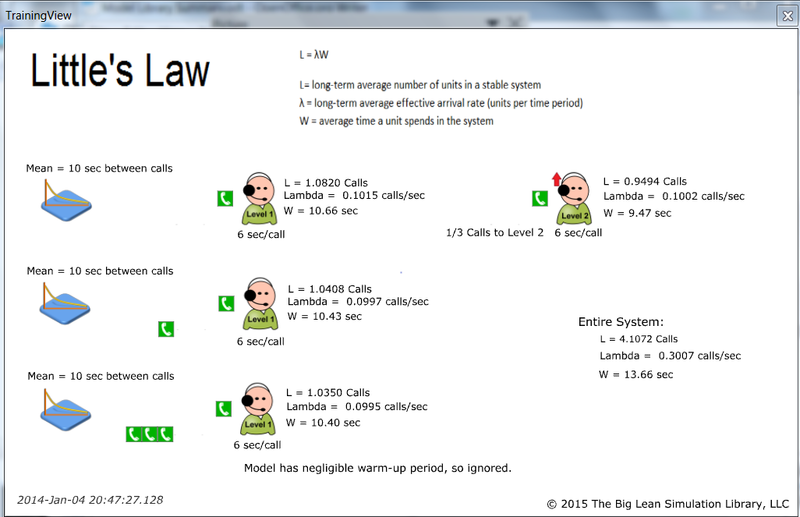 This entry was posted in New Simulation and tagged Call Center, Lean, Lean Simulation, Little's Law, Simulation, Training on January 27, 2015 by Jerry Levasseur. We expect the company to start business in 1 to 2 months. Feel free to stop by if you don’t mind the construction. In the meantime, you’ll see items added as things firm up and add more Lean and Lean Six Sigma (LSS) training materials. The lean and six sigma simulations themselves are almost done. They came out much better than we thought they would. Now we are working on the legal and financial aspects. We will have a good collection of lean simulations and games for Lean and Lean Six Sigma training. This entry was posted in News on January 25, 2015 by Jerry Levasseur.